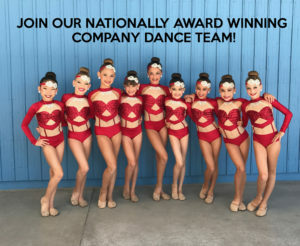 The OCPAA Company performs at the top industry dance competitions throughout Southern California and has garnered numerous high-point, top overall, choreography and special awards for solos, duos/trios and groups. Our 200+ dancers range in age from 4 to 18 and comprise several different competitive teams that receive the utmost in technical and physical training from some of the most talented instructors of our time.The competition season is from January/February to June/July with auditions in August and new team training starting soon after. Company is a serious commitment for the dancer and the dancer’s family and results in much growth, life-long friendships and of course a good dose of fun. If you are interested in joining our team please see information about our upcoming auditions and/or contact ocpaainfo@gmail.com with questions. Company 2019/2020 Auditions will be held in late summer 2019. Check back in July for more information.